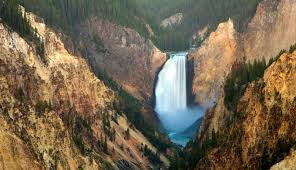 Even during high season you can find a way to visit Yellowstone National Park and with a little forethought enjoy yourself without too much stress. Here are some tips to help you keep the stress level to a minimum. SLOW WAY DOWN (both the car and you) - Before you enter the park, just set your internal speed dial way, way down. People drive very slowly here period. They are sight-seeing, trying to figure out where to park or stopping dead in the lane to take a look at wildlife and snap a photos. There are lineups behind cars turning left, lineups getting into some parking lots and some who slow way down on slopes out of fear as there are no guard rails. No sense getting frustrated, it’s just part of getting around. STAY ON THE WALKWAYS – Oh so important, especially at any site that has any thermal activity. 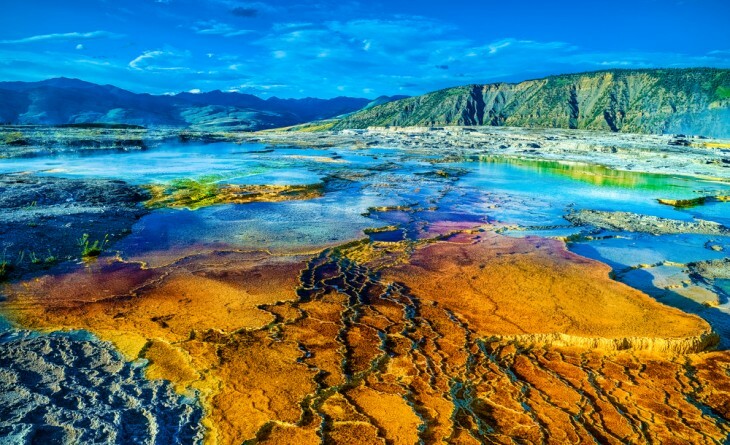 Most of Yellowstone is right on top an active Volcanic Caldera – the largest in the world. If it ever blows everyone within the park with it. 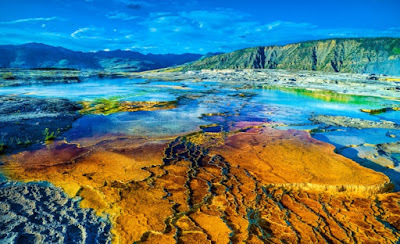 While this is deep beneath the surface, it is responsible for the thermal activity you see around you – geysers, bubbling sulphuric mud and bubbling caldrons. The walkway takes you over a crust that can include a bacterial mat. You have no idea how thick that crust is or if will support your weight. You could have your foot or all of you go through – not a pleasant thought. DON'T THROW THINGS into the thermal spouts – One would think this needn’t be said, but every year people toss all kinds of items into these deep thermal holes. SAD. Then there are those who do it accidentally. Hats fly off head, scarves get lose, I even saw an umbrella laying in one basin which I assume someone was using as a sunshade and lost to a gust of wind. HAVE A PRIORITY LIST – If you’re sight-seeing, I suggest a priority list. We starting with the top 10 list on the Yellowstone site, crossed off anything we weren’t interested in, and made a list of the others. Next we separated them into those on the West Side (for day one) and those on the East Side (for day two). Lastly we checked the map for other site we wanted to see and added those to the appropriate day. We knew which on each list was a must see and which could be crossed off if we were wearing out. Having a flexible plan going in made the day so much more relaxing. We never had to stop and consider where to go next. 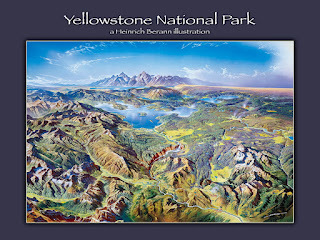 PARKING - The West Side of the Park seems to have more of the really popular attractions – the top two being Old Faithful and the Grand Prismatic Fountain. Old Faithful you have to go in the parking lot, but it’s huge and has a high turnover. Just take your time and have faith. On the East Side the only place it was bad was the Mud Volcano. Across the road kitty-corner is the Sulphur Caldron which had lots of open spaces. We parked there and walked across. At the North Rim Drive turnoff to see the falls and the canyon, it was a zoo the first hundred feet as people were scared it was full. After that there was parking at there as well as the next two lots, both very close by. 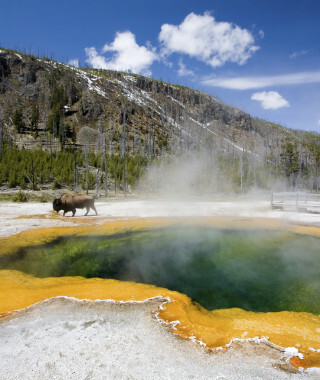 WHAT DO YOU WANT out of this experience – There really are two sides to Yellowstone. One is checking out the amazing natural sites offered at the tourist stops. High season that means it takes some planning and patience. Low season weather is more unpredictable. Then there are wonderful experiences if you have the time. There are tons of trails, a bunch of places you can drop a fishing line (license needed, you can get it there), kayaking, boating, horseback riding, ranger talks and more. You need to decide ahead of time what you want your experience to be. WHERE TO STAY – There are several choices within the park – both lodges and camping sites – as well as a big selection in Gardiner, Montana, just outside the North Gate. When the kids were small we enjoyed staying one night in the Mammoth Hots Spring Hotel. It’s walking distance from the spring, the hotel has lots of old charm and elk come into town from around 10 a.m. until dusk. Great for kids. This trip we stayed in Gardiner. Where ever you stay you need to book EARLY. Rooms book up very early, especially the better deals. Camping – most seemed to be okay with the exception of the Mammoth campground. This one was a baker’s acres with mostly scrub brush and no shade. CLOSURES AND CONSTRUCTION – There will always be areas under repair, being upgraded or closed for safety reason such as high water levels. This visit there was a significant bit of road work in one area and the trail to the bottom of Tower Falls was partially closed. You can always ask at any visitor information centre to get up-to-date information. Check out my travel blog covering my 23 day road trip across US and Canada!